Perhaps the proprietor of this restaurant was thinking of the book An Angel at My Table by the New Zealand writer Janet Frame, when he decided to build an identity to launch his new venture. But I didn’t ask him. I have the FT critic Nick Lander to thank for having found this restaurant. By chance it was “deux pas” from the Hotel Amour where I usually stay, but not known by them, surprisingly. The welcome was enthusiastic and wholehearted on entering as if I had crossed Paris, instead of after just a 3 minute walk. The warmth of the natural stone walls suggested an ancien atmosphere, and combined with the wooden IKEA tables, made for an eclectic homely effect, without a designer look. There is a small courtyard garden for sunnier days. A impressive-looking meat slicer dominates the centre of the space. This delivered appetising shavings of Italian salami on the table with the best sourdough bread while I was choosing. And then the smoked speck which accompanied a fine mousse of cauliflower which was my starter choice. Paris has had some new exciting restaurants open recently, although it has a long way to go to catch up with the effervescence of London. But somehow when I go out to eat in Paris, I am hoping for the traditional bistro approach of cooking classic tried and tested food with wonderful ingredients, that the French are so good at, and at which the chef at this restaurant Yan Duranceau excels. Even after being open approaching 3 years, there is an attitude of real concern from the staff. I had booked early as is my wont and was the only diner for half an hour, during which time, the laconic owner Jacques-Henri had time to explain to me that it had always been a dream to have a restaurant. Most of his working life till now had been in the corporate world of hospitality industry, and helping others get finance for their restaurant ventures. Soon after Yan, the head chef previously with the likes of Plaza Athénée and Taillevent, popped up from downstairs checking I was happy with the food. He needn’t have worried. The texture of my starter was exceptional. It resonates with me still as I write this a few weeks on. I dislike very much the deconstructed arrangements which some pretentious chefs go in for these days. If I order fish pie, I like a dish where the ingredients are baked together, and not arranged separately on a plate to humour a chef’s idea of artistry. Thankfully the cooking here couldn’t have been further away from this style. Having been at Rungis at 3 am that morning, my eye was particularly attuned to the freshness of the Cod à la Plancha, and it was amply rewarded. The fish sat on a mélange of Jerusalem artichokes, parsnips and swede and was surrounded by a crayfish sauce made in the best classical French manner. The delicious dessert which followed was based on a classic combination of pears, chocolate and ice cream. Sometimes it’s as well to leave the tried and tested alone, and just make them with the best ingredients. 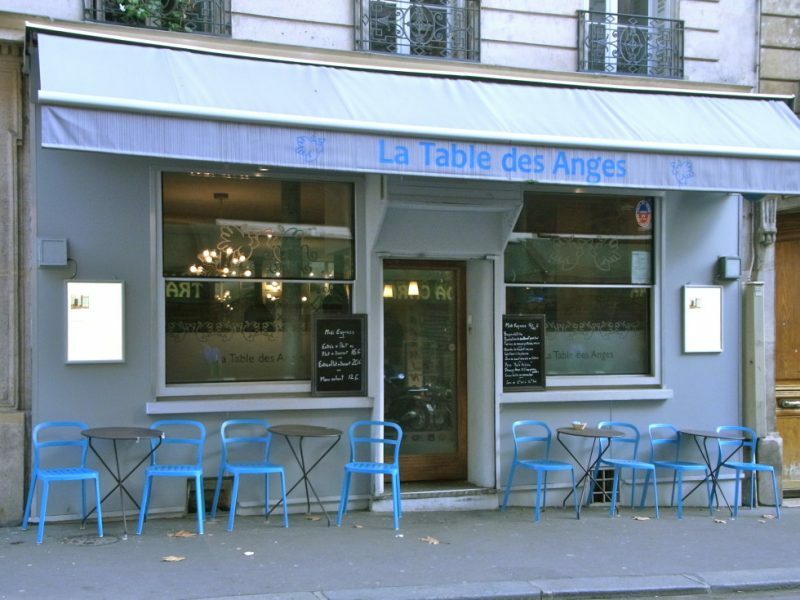 If you’re tempted by this spurt of sunny weather to hop on the Eurostar, there is an angel waiting for you at a table in Paris.